People love to trash big business, especially politicians. You know, those greedy bastards that make all those profits? Recall when oil spiked to over $140 per barrel, politicians were calling for a “windfall profits” tax? What a ridiculous notion. I don’t know, do they get a “windfall loss” tax deduction when times are bad? Well, sort of I guess, that’s a bailout, but only if you’re a big bank or a unionized automaker. I mean, the price of oil goes up and it goes down. 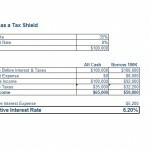 So, we’ll enact special one-time taxes when it goes up, but then it’s business as usual when the price drops? Next, there’s the Walmart rhetoric on how they’re killing mom and pop shops (even though they’re partially responsible for the lowest inflation we’ve seen in decades). Then, Microsoft was the big evil monopoly. 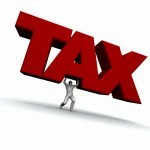 Well, I came across this article outlining which companies pay the most in taxes to the federal government. The top 5 tax-paying companies in the US contributed $43 Billion back to the US in taxes, tax rates aside. 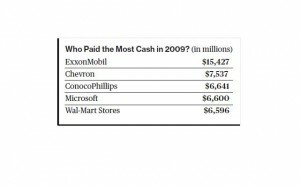 They’re all big oil, Microsoft and Walmart. 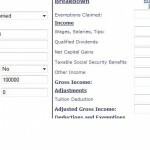 Payroll Tax Holiday – How Much Would It Save You? Interesting thoughts, Darwin. 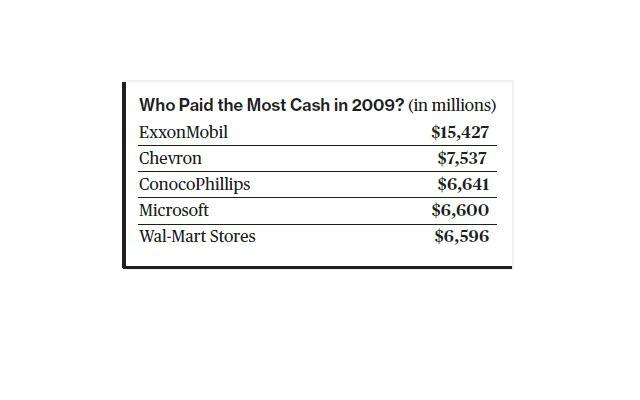 Correct me if I’m wrong, though, but I thought that though Exxon’s tax liability was $15 billion in 2009, they actually didn’t pay any taxes (and by some reports, even got a multi-million dollar discount) due to overpayment in 2008 and the foreign taxes they paid. (According to Forbes, amongst other sources.) For the latter reason, they’ve actually become the poster child for reforming the tax laws to prevent ‘tax shelters’, among left-leaning websites and the Obama administration. Not that this changes the argument that we shouldn’t be vilifying companies that follow the laws and pay as much (if no more) in taxes that we owe, but just an argument you’re likely to hear from those who would vilify large corporations (and any corporations, really). People get so mad at taxes, but it’s all perspective. I don’t get angry because I hope the money is going to fix roads, set up social programs and do all the things it should do to make a society run smoothly. If not, who would pay for all of the stuff we “need”? Previous post: Best ‘o The Rest: I Finally Met a Blogger In Real Life Edition!